The 1970 National Schools' Pilgrimage to Lourdes began for three boys on a Tuesday morning in the bustle of Victoria station. From there, they continued their journey to Dover for the Cross-channel trip to Boulogne where tea was taken in the station buffet. 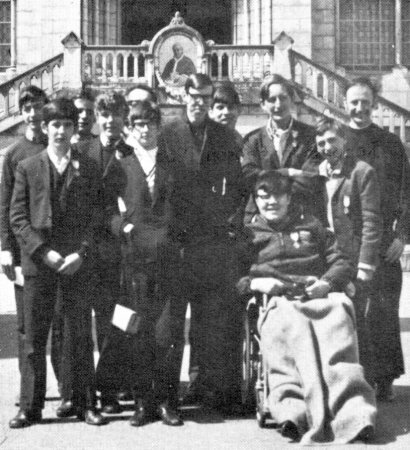 Then followed a fifteen hour train journey across France to Lourdes where breakfast was served in the "Hotel Panorama" During the afternoon, the rest of the party, consisting of three more boys from the school, Father Louis, Mr. Pickles and four handicapped boys, arrived in Lourdes, accompanied by a heavy thunderstorm - "A good omen", some said. A good night's sleep was the next step, and it turned out to be the only proper rest that the more exhuberant members of our party received. Breakfast in the morning was served at any time between seven o'clock and nine, and afterwards we had our daily Mass. On that first morning, we attended the opening ceremony of the pilgrimage, at which several members of our group were lucky enough to be chosen to carry the banner of the Catholic Association at the head of the procession. The rest of the day was spent looking around the Basilica, the Grotto and the surrounding town. It was surprising to find that two different worlds exist in the same town of Lourdes. The first is a world of brightly painted hotels, complete with fully furnished lounges and bars, cafes and souvenir shops where almost everything sold is said to have some connection with the Grotto and the Catholic Faith. The other, a world of silence and procession, is in the grounds of the Basilica and Grotto. Here the spring water has been tapped off to supply the baths and public taps, and an atmosphere of prayer and meditation is felt, as the sick wait in hope of a cure. Two processions are held daily. The first of these takes place in the afternoon, and, at the end of the Blessed Sacrament is passed over the sick. In the evening, there is a torchlight procession at which each pilgrim holds a lighted candle, and the continuous sound of the "Aves" rings out in the night as the column of light streams around the Grotto area. The average day, if there was one, was spent moving between the two worlds of Lourdes, from Mass to souvenir shop, from procession to cafe, and I think that I can speak for everyone when I say that we all had an enjoyable time. This was especially so because of the very happy atmosphere which existed between the different groups in our hotel, and, as a result, practical jokes flowed like water. The only feeling of sadness came at the end of our week in Lourdes, when we had to return home to England. In closing, I must thank Father Louis and Mr. Pickles for putting up with us for a week, and Father Louis again for organizing the trip, and working so hard to make it a success.